Hi! It’s been a while, we know and we can only apologise. We’ve had lots of new work completed in our showroom, we’ve been busy in homes all across Chester and we’ve even had to revamp the website. We hope you love the new look. One of the things that you loved the most – or so we were told – was the monthly Supper Clubs. Whilst we find a way to get something permanent in terms of getting a chef to cook some wonderful dishes for a supper club we are going to hold ourselves, we didn’t want to let you down when it comes to giving you some great ideas for another seasonal smorgasbord of delights. April, it’s time for Spring – even if the weather forecast wants to go against us – meals with the family over Easter and of course lighter evenings which mean lots of new flavours to try in these springtime days. Whether it is crisp green vegetables, seasonal fish or just some great pasta creations, we’re sure that our suggestions will provide the spark of creativity you might be looking for to try something new. A great place to start is with seasonal vegetables, perfect for Springtime feasts. Watercress, spinach, lettuce, they’re all on the menu and for good reason; they are simple and there is lots of the stuff growing everywhere. Our suggestions don’t move away from these seasonal selections and we think these two choices might just be what you were looking for. The first is a seasonal curry using spinach. Quick to make, tasty and perfect for a vegetarian diet as well, spinach and paneer curry ticks all the boxes. Our second choice, however, is an ode to watercress. 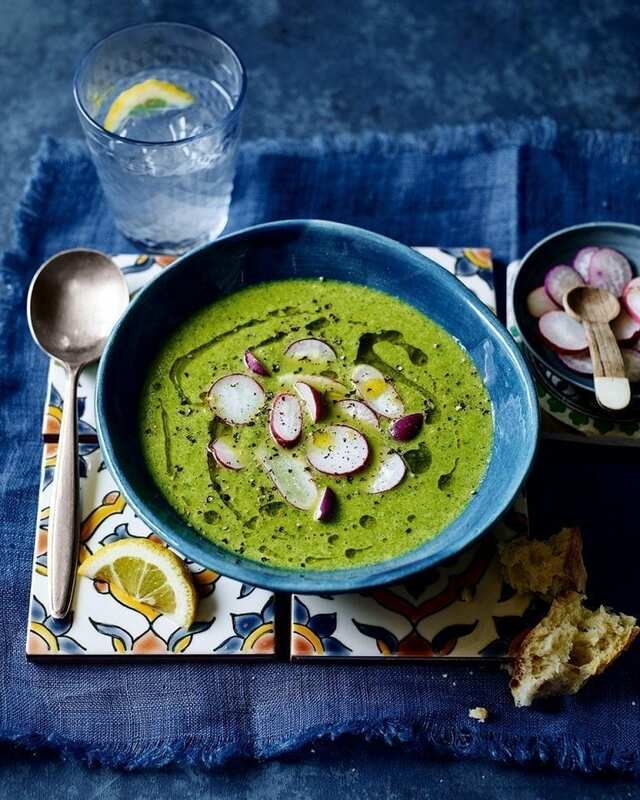 Usually an afterthought on a sandwich, this is the perfect way to champion such a great ingredient, chilled radish, watercress and tahini yoghurt soup. One of the great ingredients in season this month is, prawns! Actually, brown shrimp, crab and langoustines are all great this time of the year. With that in mind, we think that these are great dishes to try for the month. The first is a household favourite and it comes from… Jamie Oliver! Yes, he really does do great pasta dishes and this fennel and crab dish is just five ingredients. It tastes great and, it’s really simple to do as well. Rick Stein has an alternative crab pasta dish that throws in some chilli for that bit of kick – well worth the try! If you wanted to get a flavour of the East in your meal repertoire then you can’t go wrong with this prawn and tofu pad thai. It’s simple, fast and packs lots of flavours as well! Rhubarb is still in season and what a great time to celebrate different flavours with this great ingredient. The first recipe we have is an Oaty rhubarb and ginger streusel cake, perfect for a Sunday bake, and great to sit down with a cup of tea and enjoy with friends and family alike. But what about something a little more special, possibly even for Easter lunch? Well, we have two ideas. The first is rhubarb and amaretti crumbles. 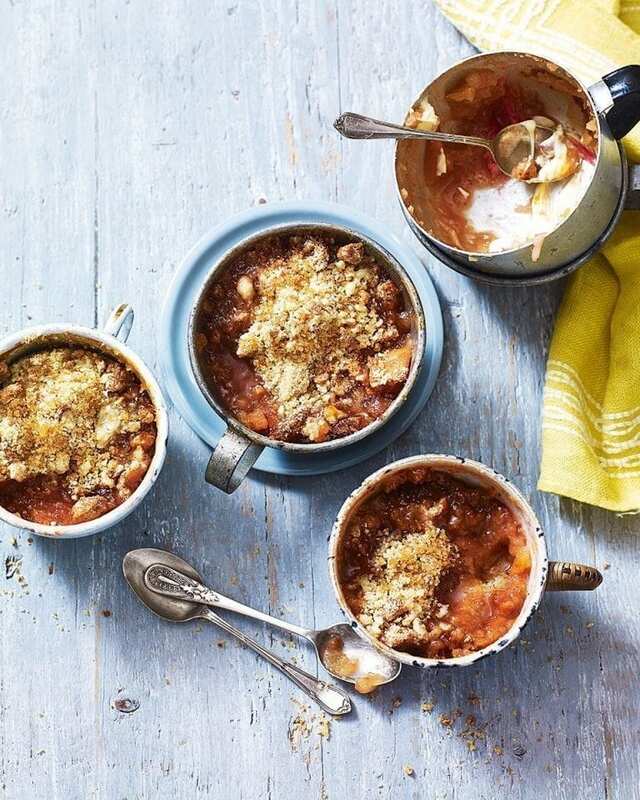 They are simple to make and they combine that almond flavour beautifully with the rhubarb that really go well together. The second recipe is from Jamie Oliver, here you get to show off with rhubarb sorbet and pistachio brittle. Aside from the amazing colour, the peanut brittle will challenge the best of chefs to something wonderful and delicious. That’s our April roundup. If you have any dishes that you want to share for next month, please drop us a line!